The Christchurch paper The Press carried a casting call ad in its weekend edition. For unknown reasons the paper actually featured two articles on the upcoming casting and did not mention the exact location in the first report. This resulted in nearly a hundred phone calls to the editor of The Press over the weekend. And even on the day itself some of Christchurch’s better known actors still did not know where to go to! 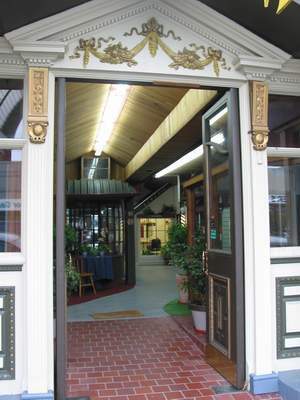 Only after many hasty phone calls the location was established as a well-known Performing Arts Academy. The well-hidden entrance to the Narnia casting. The casting would officially begin at 11 AM and many hundreds are expected. Around 9 AM still no one has turned up yet and a certain nervosity is in the air. What is going on? 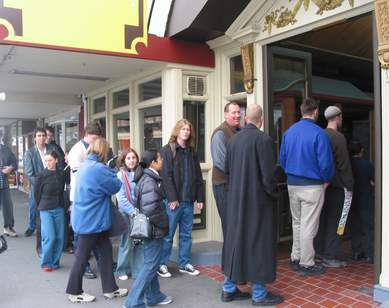 Many years ago people had slept in waiting lines to audition for Lord of the Rings. But the Narnia-applicants do not let the casting crew down and finally start rolling in. Things are getting really busy inside when last preparations are done. Just then news are getting in that the flight of casting director Victoria Cole will arrive late. There is a certain tension in the air and most people wait in silence. It is interesting to see who is present. Many people are of average height and will not stand a chance. Still, they seem willing to give it a go. A few people are in costume and various news teams add to the buzz when preparing shoots and interviews for the local news. Casting director Victoria Cole has finally arrived and addresses the crowd in person, reminding them of the requirements. One has to be below 5’0″ or above 6’4″ to be considered. All others are invited to send in their details for later occasions. Also, Victoria mentions that a second casting call will be made in August. 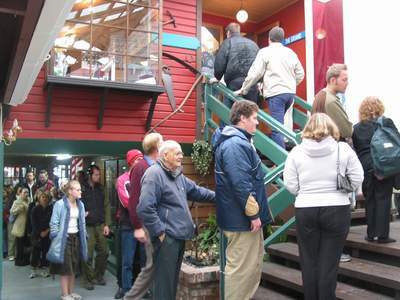 This is the best chance for ordinary Cantabrians to become a part of the actual location shooting cast. 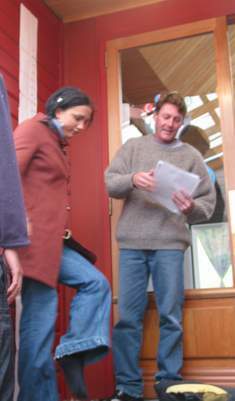 The current schedule indicates three month of shooting, of which most will be done in Auckland. However, actual location shots will also be done down on the South Island with its spectacular scenery. It is rumoured a major battle scene will take place in Canterbury, fueled by the fact that local stunt fighters and martial artists were contacted with questions about “proper equipment and battle choreographies”. 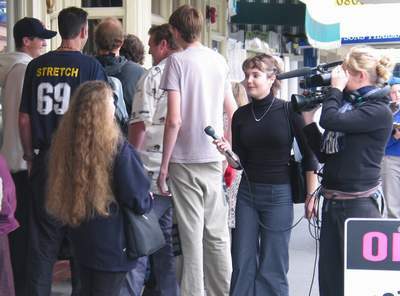 Back in Christchurch the first problems occur when aspirants are measured in public. Most people are turned down when it becomes apparant that they do not fit the height requirements. Some try to tricks their way in by using high plateau-shoes or daring hair creations. Those who do have the right height are invited to step inside. In a matter of minutes first tears are flowing outside while joyful phone calls are made inside. Many comment proud that they would finally have the right height for something – after years of teasing they feel rewarded. 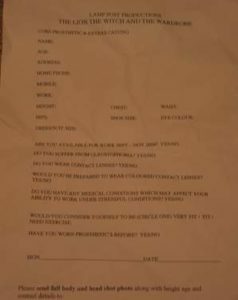 Those inside are given a more detailed sheet asking for body measurements, fitness levels and very important availability. There is some talk among those waiting and some only now realise that this call is mainly for body prosthetics extras. Successful extras will be required to wear uncomfortable and disguising body parts or suits. But some expected speaking roles and others “can only work weekends”. Still, more and more suitable applicants arrive in the waiting area and soon the first ones are off to see Victoria herself. This is where first photographs are taken, too. Successful applicants will be contacted within the next few weeks. All others are invited to come back in later casting calls. Alternatively, they are given sheets to send in their details directly to Lamp Post Productions. For all those who missed out so far: all major New Zealand newspapers will carry casting calls with the production company’s address over the next weeks. Good luck to All!